GFA’s Elyse Kimball has verbally committed to play soccer at Richmond after she graduates. Elyse and her sister Lexi, a sophomore basketball player at Georgetown, are believed to be the first siblings from GFA to play at the Division 1 level. WESTPORT — There’s another Kimball who will be forging her own path at the collegiate level. Elyse, the junior forward and standout for the Greens Farms Academy girls soccer team, recently gave her verbal commitment to play soccer at the University of Richmond. She will join her sister Lexi, a sophomore who is making her mark for the Georgetown University basketball team. The sisters will be the first set of siblings from GFA to play D-I athletics. Even though her sister showed her the way to become a top-notch student-athlete, Elyse Kimball has followed her own path to becoming an excellent soccer player at GFA. She has made an impact as a Dragons since her eighth grade year, either leading or tying for the leading scorer honors on the team. 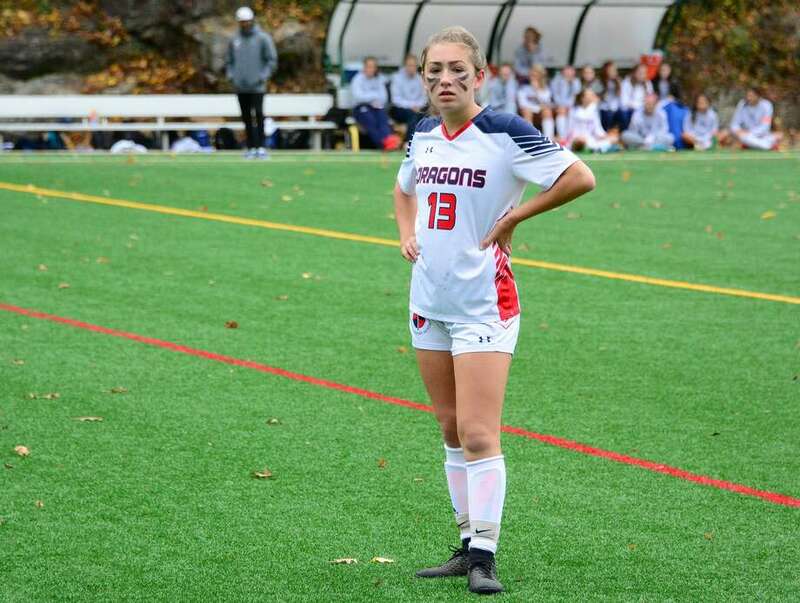 This past season, she netted 11 goals while leading GFA to the Fairchester Athletic Association title game where the Dragons suffered a tough 1-0 loss to Greenwich Academy. For her efforts, though, Kimball was an All-FAA, All-New England, NESCAC and WNEISWA All-Star. “She’s a hardworking girl who sticks to her tasks,” GFA’s second-year coach Andrew Henry said. “She wears her emotions on her sleeve, and that helps her. She holds herself to a high standard and when her standards aren’t meet, she has to be reined in but that’s a good problem. Kimball, a Westport resident, said now that she has decided what school to attend, it’s been a huge weight off her shoulders. She said the staff at Richmond is amazing, led by head coach Marty Beall, and it focuses more on the person over the player. Playing an important role right off the bat would be ideal, Kimball said. Henry said even though Kimball will be playing at an established Division I program, she will excel in the long run because of her work ethic and her high soccer IQ. The future seems bright for Kimball and she still has one more season of high school soccer left as a Dragon. Henry said he’s pleased to have her back for one more year and he’ll be counting on her to lead the team as a captain. Kimball said it’s an honor to serve as a captain and she’s looking forward to helping GFA get to where it wants to go. And soon she’ll see there’s nothing like college soccer as well.